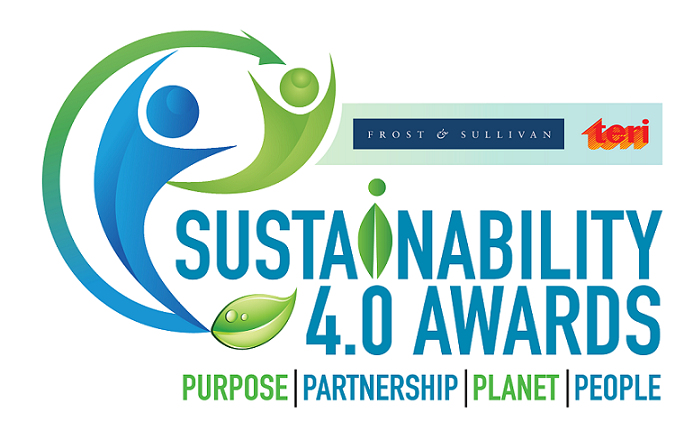 Frost & Sullivan and TERI will jointly host the 10th edition of ‘Sustainability 4.0 Awards’ on 21st June, 2019 in Mumbai. The nominations for 2019 Sustainability 4.0 Awards are open until December 31st, 2018. For the last two years, Frost & Sullivan and TERI have been hosting the program together and aspire to be the driver of sustainable development among organizations in the country through this awards platform. Frost & Sullivan and The Energy and Resources Institute (TERI) will jointly host the 10th edition of ‘Sustainability 4.0 Awards’ on 21st June, 2019 in Mumbai. For the last two years, Frost & Sullivan and TERI have been hosting the program together and aspire to be the driver of sustainable development among organizations in the country through this awards platform. The mission of this program is to partner with participants in their sustainability journey, while recognizing business enterprises that have adopted a holistic sustainability framework integrated into the organization’s DNA. Companies interested in participating in this edition of the awards need to submit their nominations by December 31st, 2018. To know more about the awards or to participate, please mail to Ms. Sutanuka Sarkar at [email protected], with your full name, company name, title, telephone number and company e-mail address or please log on to the event website – http://sustainability4awards.org/. The assessment framework for ‘Sustainability 4.0 Awards’, has four major parameters (Purpose, Planet, People and Partnership) and 13 sub-parameters. The evaluation framework is regularly updated taking into consideration global sustainability frameworks and future sustainability challenges and reporting requirements. Each participant is evaluated by a team of experts from Frost & Sullivan and TERI, benchmarked against peers and competitors, and strengths and opportunities for improvements are highlighted, to take their sustainability journey ahead. The award program has three levels of recognition – ‘Believers’, ‘Challengers’ and ‘Leaders’ with respective, predefined qualifying scores. The top two highest scoring companies (overall) will be recognized with ‘Sustainable Business of the Year’ and ‘Sustainable Business of the Year – 1st Runner-up’ awards, respectively. This year onwards, ‘Jury Special Mention Award’ will be conferred for programs that are best in class, are scalable and are replicable across industry verticals. Through this recognition, we aim to enhance sharing of best practices across the organizations. Number of recognitions in this category will be at sole discretion of the Jury members. This event is supported by media partners – Commercial Vehicle and MTLEXS. The Energy and Resources Institute (TERI) is a leading think tank dedicated to conducting research for sustainable development of India and the Global South. TERI was established in 1974 as an information center on energy issues. However, over the following decades, it made a mark as a research institute, whose policy and technology solutions transformed people’s lives and the environment. TERI’s key focus lies in promoting clean energy, water management, pollution management, sustainable agriculture and climate resilience. TERI’s Council for Business Sustainability connects its research work with the corporate sector. The Council guides the Indian corporates to frame and implement their sustainability agenda.